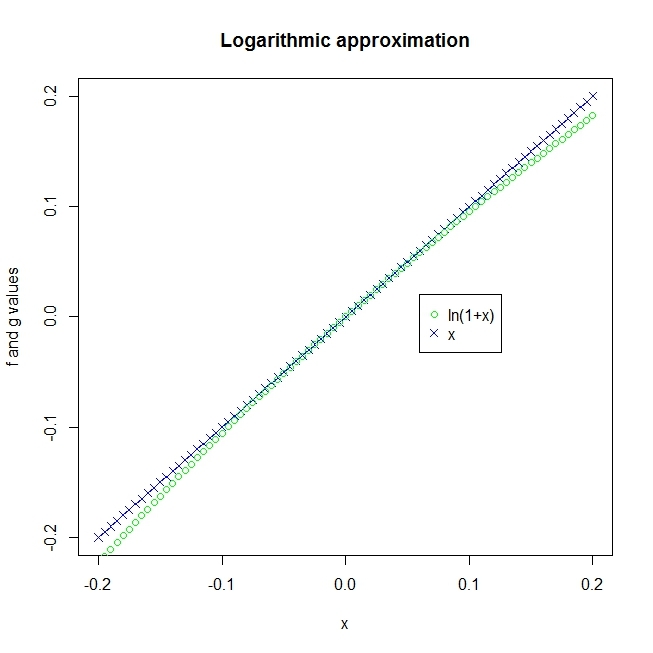 I’m almost done going through the CFA material for the Level I curriculum and I came across what they simply call an approximation in the Schweser resources but what actually is in fact a logarithmic approximation of numbers close to 1. 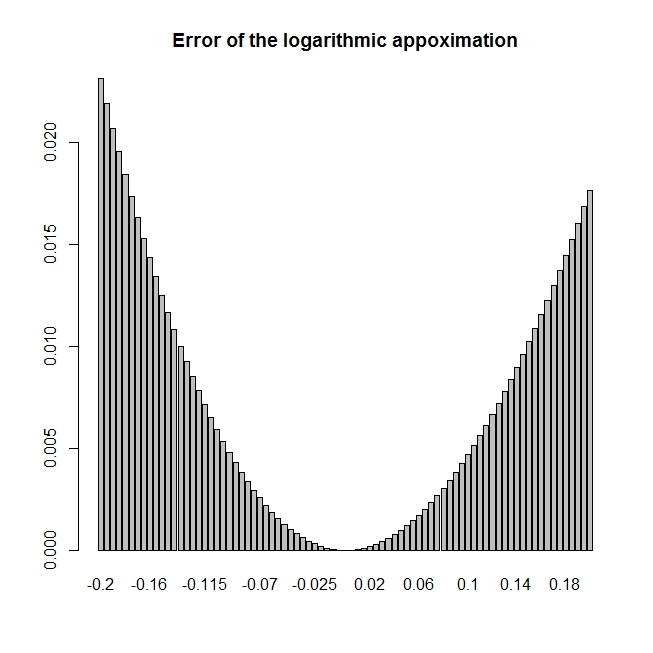 What is the logarithmic approximation for numbers close to 1? The error is pretty small! As we can see on the graph it gets larger as $x$ gets away from 0, but this the important thing is to see that, as long as $x$ is close to 0, the approximation is pretty good. At some point of the curriculum they discuss about, they talk about the term structure of the interest rates. As this term structure is not flat; higher interest rates are (usually) required for bonds with higher maturity. This is why you have different yield for bonds with the same features but different maturity $T$. Let’s yields defined at time $t$ for maturity is defined as $R(t,T)$, they are the spot yields at time $t$. There is also the possibility to enter a forward agreement, called forward yield, which allows you at time $t$ to have a certain rate between time $T$ and $S$, which we denote by $F(t,T,S)$. Let’s take an example, you know that $R(0,2)=4\%$ and $R(0,3)=5\%$ and you want to calculate $F(0,2,3)$. By applying the formula above, you find that $F(0,2,3)=7.03\%$. As you can see, both the real value, 7.03% and 7.00% are pretty close! If you use a calculator, you find that the result is 0.9727388, which is pretty close to 0.97. I’ll be back with more CFA footage soon!